Every now and again a game comes along that comes out of nowhere, challenges the big boys on the block, knocks a few heads around, and walks away victorious with trophy in hand. Not too long ago that game was LittleBigPlanet for the PS3. When it released in 2008, it surprised a lot of people with its fun yet challenging platforming, and customization. 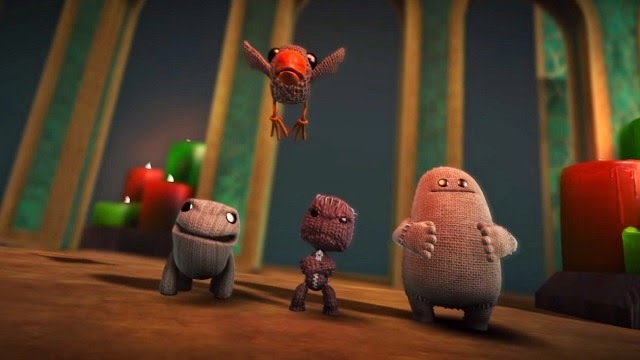 Despite the cute look of the game (who can forget the iconic SackBoy, pseudo-mascot for the PS3 for some people), LittleBigPlanet offered gamers the ability to not only decorate their characters with a variety of skins (even some from other popular franchises), but to also create levels for the online community to enjoy and challenge themselves. I got my first taste of the series with a free copy of LittleBigPlanet 2 I received and it did not disappoint. Not only was I sucked in by the platforming and the adorable childhood real-world-imagination-inspired look of the game, but my fiancée was so taken by the costumes and cuteness that it instantly became a couple’s game for us to enjoy together. We had so much fun that I knew I’d have to pick up LittleBigPlanet 3 when it came up (not like my fiancée would give me a choice in the matter). Surely the folks over at Sony and Sumo Digital wouldn’t disappoint. 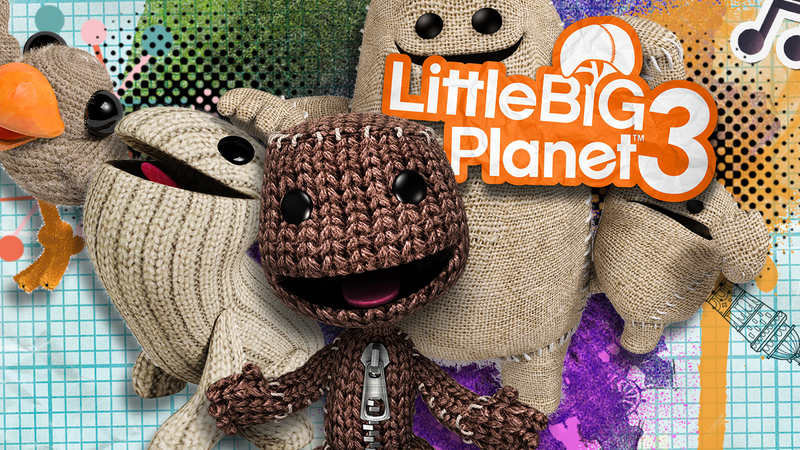 Unfortunately for us, not only did LittleBigPlanet 3 disappoint; it was flat out awful. I’m sorry to those of you who are willing to look past a game’s many faults to find the “silver lining”, but I’m not going to be an apologist for a game that’s so buggy that it can make the game frustrating on a level that borders unplayable. At first you don’t notice the issues as much, because they happen infrequently; however, the more you play, the more you notice things, like your SackPerson falling through a floor and getting stuck, or losing control over your SackPerson for a few seconds as you watch them helplessly careen into DOOM because you can’t stop them from running left. The most common thing you'll see the entire game. Those are just two examples of many times I found myself wondering how such a great franchise could have a game so obviously flawed and in need of further testing released to the public. Even my fiancée, who is a saint compared to me and my levels of patience, found the game’s frequent bugs so upsetting that she asked if we could stop playing for the night. It just got to the point that it wasn’t even worth playing anymore, and that’s unacceptable. However, bugs, glitches, and straight-up broken-ness aren’t the only issues that cause LittleBigPlanet 3 to suffer. The most glaring was the time it took to load anything in the game. Loading screen times were long – I’m talking 1990’s-PS1-RPG-with-multiple-discs long. When you’re 2 systems and 10 years removed from those kinds of issues yet suffer from them, you’re doing something wrong. It was so bad that there was a running joke between me and my fiancée – when a loading screen came up we’d ask one another to do something like go change the oil in the car or make dinner while we waited. It was funny at first, but eventually the jokes and the loading times got old and we just stopped caring. Another issue, albeit a minor one, with LittleBigPlanet 3 was the presentation of the game. Mainly the story and characters were dull and uninspired. You’re transported to a new planet in the universe, Bunkum, by an unskilled creator named Newton. He asks your help to defeat an evil witch who is bent on freeing three evil spirits who will steal all creativity and imagination from the world forever. When you confront the witch, there are a few twists, things go wrong, and the spirits are released. You’re now tasked with freeing three legendary heroes to help you stop the evil spirits once and for all. It’s a tale so simple that a child could’ve written it, which might be the point, but with a weak story, I’m going to need a little more to grab hold of me. Brave warriors of fabric, assemble! While the story of LittleBigPlanet 2 wasn’t anything to write home about either, the characters and voice-acting (especially Robbie Stevens as Larry Da Vinci) were brilliant enough to make me forget about the simplicity of the plot and enjoy the experience. There was no such brilliance to distract me from the shortcomings of LittleBigPlanet3, as the characters were barely introduced, had little to no backstory, and overall felt forced upon the player for no other reason than to move the story along. Couple that with voice-acting that was over-the-top annoying (e.g. – dialogue that dragged on so much that I found a better use for my time in the form of a bathroom break) and you can see why it was hard not to focus on the frustrating bugs in the game. Like any game (well, almost any game), LittleBigPlanet 3 does have some redeeming qualities. The introduction to three new playable characters adds some welcome variety to the platforming elements of the game. One character (and my personal favorite), OddSock, is a speedy running character who can run and jump up walls. The style of gameplay tests gamers in precision unlike any previous game in the series has to date, and I personally enjoyed the levels featuring OddSock (when they weren’t broken) the most. The second addition is that of Toggle, a shapeshifting SackPerson who can flip between a large, lumbering, and brutish state, and a smaller, faster, and more maneuverable form. 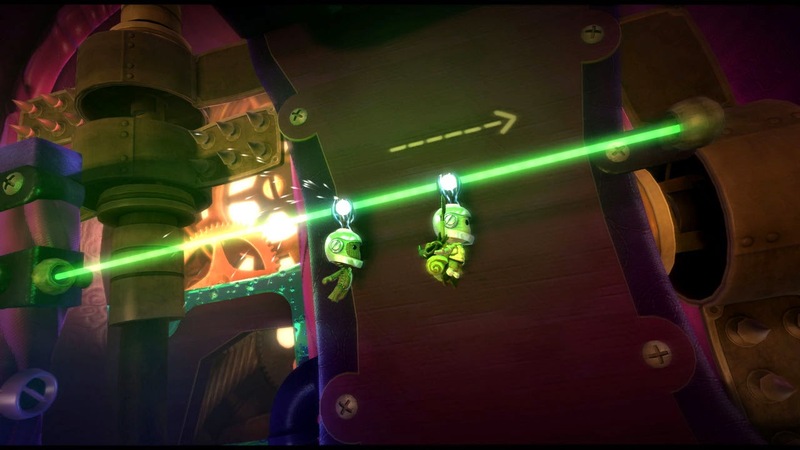 While the puzzling elements involving Toggle were challenging, they were more on par with what one experience with SackBoy, and wasn’t as impressive at those featuring OddSock. Lastly, you could play as Swoop, my fiancée‘s personal favorite. Swoop is a bird and as you might expect requires you to fly and swoop through obstacles and around enemies. The Swoop levels added the most difficult challenges because the player is required to tap X repeatedly to keep Swoop in flight, and combining that with near constant motion and avoiding obstacles made for some fun yet difficult levels. Apart from the new characters and gameplay elements, LittleBigPlanet 3 also introduces new Power-Ups for your SackPerson to use, each giving you a special ability to progress through a level or reach previously inaccessible areas in a level to find more collectibles. Many of them were fun to play with but the method used to switch between them via your Popit menu was tedious and broke the flow of gameplay, especially in levels requiring the use of one or more power-ups. This was actually fun...when you had the chance to do it. Unfortunately, my fiancée and I did not get to explore the level creator and other community-based functions of LittleBigPlanet 3. This was purely due to the fact that we gave up on a game that is so glaringly in need of fixes and couldn’t find any reason to return once I beat the game (and I mean that I beat the game solo, because my fiancée rage quit for the last time near the end of the game and vowed never to return). It was a large disappointment for both of us that the third installment of this charming franchise didn’t even come close to living up to its predecessors. However, if there is a silver lining in all of this negativity (I guess I’ll go there), it’s that the bug and glitching problems plaguing LittleBigPlanet 3 are still 100% fixable. While it wouldn’t fix the loading times and the story/character issues, it would make the game more inviting for those of us who want a more consistent experience with our video games. I wish I could say I recommend LittleBigPlanet 3 to gamers and fans of the previous installments, but there simply isn’t enough to be done that can cause me to overlook how broken the game can be at times. There’s still a ton of cuteness in the game, and if you’re one with a creative and imaginative mind, I’m sure you can find plenty to do with character customization and level editing. I, however, am not that type of person, and therefore cannot say with confidence that anyone would have a pleasant, cohesive romp through Bunkum in the main campaign mode. Not even SackBoy’s tongue-wagging happiness can sway me to the light. As a big Final Fantasy fan, I wish I could tell you when my first experience with the fabled and widely celebrated JRPG series occurred. I know when I absolutely fell in love with the series – that was when I played Final Fantasy VII for the first time on the original PlayStation (much like a lot of people around my age, living in North America). Still, I know that I had exposure to the series earlier than that, but all I have to go on is a vague memory from my childhood of playing a very difficult RPG on my SNES that I rented from a local Blockbuster. I assume the game was Final Fantasy III (or Final Fantasy VI to fans across the Pacific), but my memory is so foggy I can’t be positive. The memory has haunted me for a long time, because I know I never finished that game long ago, and as big a fan I am of Final Fantasy, I’ve actually only beaten four games in the numbered series (and one of those is a sequel): Final Fantasy VII, Final Fantasy IX, Final Fantasy X, and Final Fantasy X-2. Honestly, that’s a pretty pathetic list for somebody who claims to be a fan. I can easily chalk it up to my youth when a lot of the games were released (I was born in 1986), but I’ve been an adult for way too long with a steady income to have any more excuses, especially since a lot of games have been ported to other systems for North American audiences. I then began researching what it would take to play every numbered game in the series in order. As a resident in North America, I’m well aware of the odd releases and numbering surrounding some of the games (like Final Fantasy IV released in North America as Final Fantasy II for the SNES), and I started to realize this might be very befuddling to some gamers and fans of the series. I then decided I would create a helpful guide for those who wish to play any of the Final Fantasy series without the confusion. I’ve included the actual order of the numbered games below, and what systems folks in North America can play the game on, as well as any alternate names. I hope you find this helpful. There, now you North American fans of the much-loved Final Fantasy series have no more excuses when it comes to playing the numbered series in its entirety (and in order). I’m well aware that there are plenty of sequels and prequels and spin-offs of the main series games, and I have no problem with folks playing the sequels as a part of the experience. However, I believe that the original numbered games in the series are the stars of the show and that is why I’ve only included them in this list. I hope you’ve found this guide helpful, and good luck to any fans out there who plan on tackling this amazing series in order. *I understand that Final Fantasy XIV: A Realm Reborn is not the original 14th game released. However, seeing as how Final Fantasy XIV Online failed and was eventually overhauled into ARR, and now that the original game servers are down, there is no legitimate way to play Final Fantasy XIV Online. Therefore, Final Fantasy XIV: A Realm Reborn is the logical choice for the 14th game in the series. I’m a bit behind on my write-ups for the #52GameChallenge, so this one is going to be shorter than others. I didn’t quite enjoy the experience as much as I thought I would, and I’d rather spend more time on other games I’ve played. Apologies to anyone who loves CBFD. Even though the Nintendo 64 is my favorite console of all time (mainly for nostalgia, but the library isn’t half-bad either), there are still plenty of games for the plucky retro system that I haven’t played. 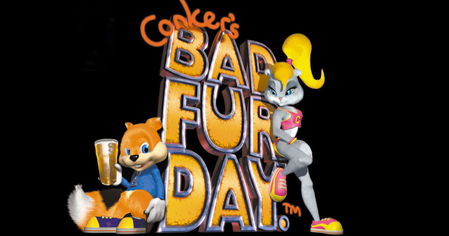 One of those games is the infamous, lewd, and foul-mouthed Conker’s Bad Fur Day. One of the reasons is obvious – I was way too young to play it when it released in 2000. The other reason is because it’s a fairly uncommon game to find and therefore is a bit expensive, especially in good condition complete-in-box. Recently I had a stroke of luck and found a good copy via a friend who gave me a huge discount and was finally able to play this mature game I’d heard so much about. Okay, maybe "mature" isn't the proper term. I'm old enough. Now I wish I could say that I really enjoyed the game, but overall I found it frustrating and a little boring. While the dialogue is hilarious and pokes a lot of fun at gaming conventions, I found the lack of direction frustrating, and the platforming elements wore thin really quick. There simply wasn’t enough variety to keep me interested in each new world for long. 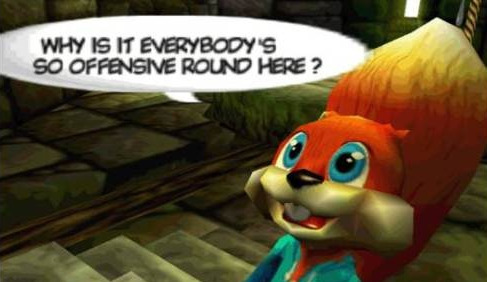 Even when Conker goes FPS, those segments didn’t control well at all and the game was less than forgiving as a result (but the cut scenes and movie references are much appreciated and well done). Combine that with the ever-present Nintendo 64 camera issues and you’ve got an experience that leads to a lot of reloads. Fortunately, the game doesn’t take death or lives seriously and you pick up where you last left off when you die and even when it’s “Game Over”, so you’ll have no problem giving a difficult segment another go.